Green Beans are a favorite around here. We really like them, and have shared our recipe for garlic green beans which are made from fresh or frozen green beans. 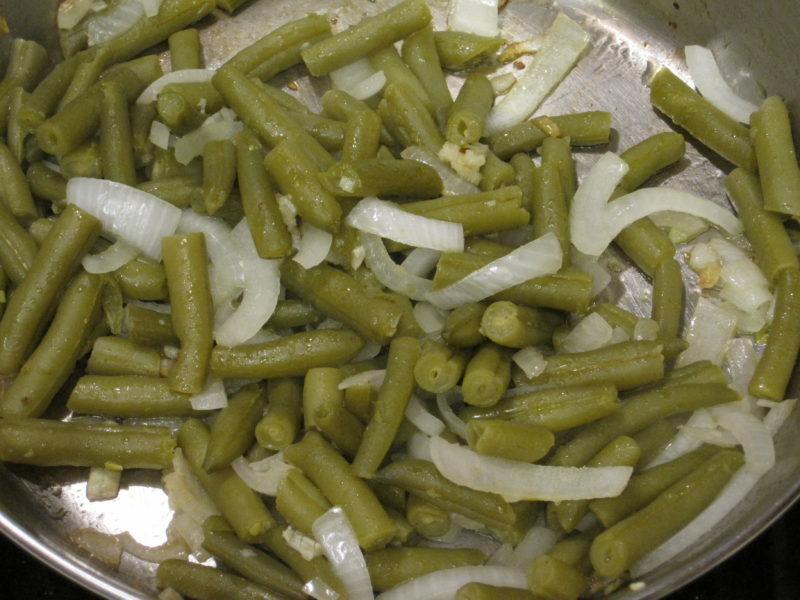 Since we are in the midst of our 30 days of cans challenge, this recipe for Green Beans with Onions and Garlic is made from canned green beans. The recipe is very simple and is ready for the table in about 15 minutes. If you’re not a fan of canned beans, let me give you a little tip. Draining the green beans and rinsing them helps to remove the “canned” taste. That technique can be used in any recipe to improve the flavor, but it results in the loss of some water soluble vitamins. The addition of onions, and garlic, to this recipe helps to mask the canned taste, and they add even more flavor to this simple and delicious side dish. For those people who dislike canned vegetables because they think they might not be as nutritious as fresh, I’m sorry to tell you that you may be in for some bad news. Fresh vegetables lose nutrients from just sitting around waiting to be consumed. It may take two weeks for those fresh veggies to get from the field to your plate. During that time, vegetables will lose between 10 and 50% of their nutrients. Canned, and frozen, vegetables are processed shortly after picking. As a result there is no further loss of nutrients except that which occurs from the heating for the canning and freezing process. (Frozen vegetables are blanched, briefly immersed in hot water, to retain color and texture prior to being frozen.) Check out this table regarding the nutritional differences between canned and really fresh green beans. It’s very interesting. 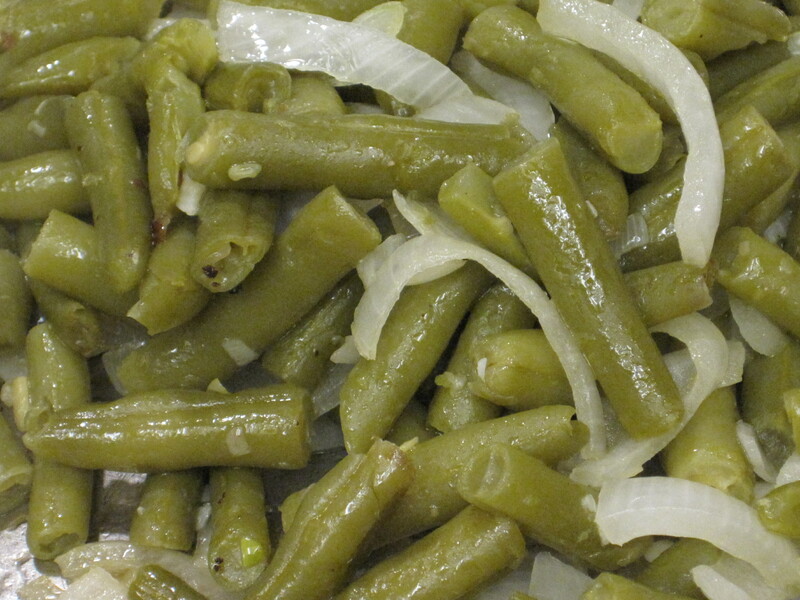 Give our recipe for Green Beans with Onions and Garlic a try and let us know what you think by leaving a comment below. Canned vegetables can be a great help with getting dinner on the table. Adding fresh foods along with canned, helps to elevate the flavor from just plain canned to something special. Cook's Note: If you desire, instead of draining and rinsing the beans, you can add the cooking liquid to the pan with the onions and garlic, and allow it to cook on the stove until the liquid is absorbed. This allows the flavor of the onion and garlic to better permeate the beans, but the beans can end up tasting very salty this way. If you choose to use this method, low salt beans might be a better choice. Total Cost of Recipe = $1.43 or $0.36 per serving. Add sliced onion, and garlic to the oil in the pan. Saute onion and garlic for 1-2 minutes. Add green beans to onions and garlic in the pan. Saute, stirring frequently until onions are translucent, and beans are thoroughly heated.